As Vikram carried Betal on his shoulders. Betal started telling him a story. There was once a very rich man called Dhaniram who was a miser and never donated money for charity. When his servant Rameshwar asked him to do some charity. Dhaniram said that he did not want to be known as a charitable person. So Rameshwar asked for some money from Dhaniram and used it to set up a water tank for travellers. Everyone praised Rameshwar. He took more money from Dhaniram and built a small inn where travellers could rest. He again asked for money and this time made free food available at the inn. One day, Dhaniram died and Rameshwar had no source of money. He started charging a fee for the services. The travellers got very angry and killed Rameshwar. 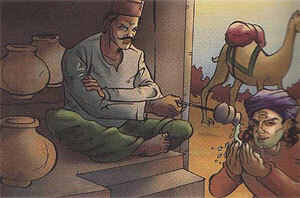 Betal asked Vikram, "Tell me, who was resposible for the death of Rameshwar, Dhaniram or the travellers?" Vikram replied, "Rameshwar himself was responsible for his death. He should have made arrangements for the time when there would be no money to run the inn. Either he should have charged a small fee from the beginning or should not have charged anything even later. " Betal said, "You are very wise. This is the right answer. But you answered the question so I will not go with you." Saying this Betal flew back to his tree.